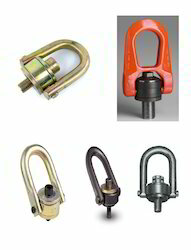 Offering Swivel Eye Bolts, Swivel Hoist Rings, Swivel Rings Double Sheave Shackles & Swivel Hooks. Importers and Stockists of Swivel Eye Bolts for lifting from M16 to M42 in capacities from 1. 6 to 12. 5 Tonnes, Swivel Hoist Rings from M20 to M100 and 2 Tonnes to 30 Tonnes. Double Swivel Shackles, Swivel Hooks, Snap Hooks, etc sourced from the world's most reputed manufacturers. Round Slings are useful for lifting loads of a fragile nature and which may be damaged by the harder webbing. 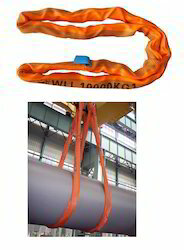 Round Slings are manufactured to BS 1492-2:2000 with safety factor of 7:1 from 100% Polyester. The outer cover is a seamless polyester sleeve which has excellent abrasion resistance. The core consists of a continuous hank of high tenacity polyester yarn which is strong and durable. Due to parallel fibres in the core the stretch experienced with a round sling is less than 3% at the safe working load. 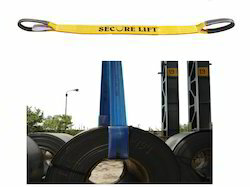 Round Slings are color coded for ease of identification and are available in a complete range of sizes and strengths up to 125 tonnes. CROSBY is the world’s most reputed name when it comes to lifting tackles. All Crosby products are load rated, fatigue rated, quenched & tempered,type approved & rfid equipped. Load Rated is a registered Crosby trademark that identifies products that have the Working Load Limit indicated or affixed to it. The following Crosby products have the Working Load Limit forged or stamped onto it, or identified on a label affixed to the item. In addition, the following items have a rated Working Load Limit published in Crosby literature that can be referenced by a code, grade, or size forged or stamped onto the product. Fatigue Rated is a registered Crosby trademark that identifies products that have pre oven to provide improved fatigue life (fatigue resistance) in actual use. Fatigue resistance is a characteristic that is a benefit from the Quench & Tempered heat treat process utilized by Crosby on many items. At Crosby, products are Fatigue Rated to the CEN Euronorm Standard which is 20,000 cycles at 1-1/2 times the rated Working Load Limit. The following Crosby products are currently Fatigue Rated. One can avail a wide assortment of D- Shackles from us in bulk. 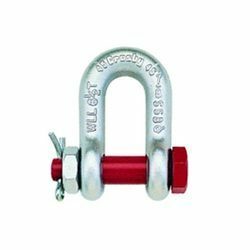 The offered D- Shackles are extensively used to attach halyards to sails, especially sails fitted with a headboard such as on Bermuda rigged boats and in many other suitable applications. Our products are of world class quality and easy to use. 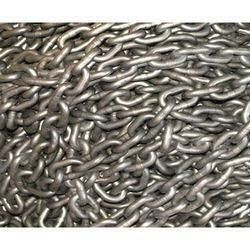 Having year of experience in this domain, we are involved in offering best quality of Grade 80 Lifting Chain. 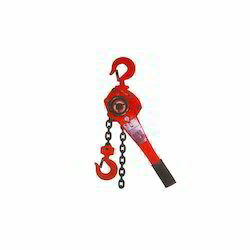 This Grade 80 Lifting Chain is extensively used Grade 80 Lifting Chain is available in the market in various sizes. 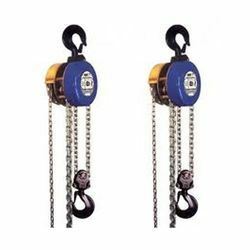 Grade 80 Lifting Chain is extensively used in various suitable applications. These slings are formed by two and more identical pieces of Webbing placed side by side terminated at each end of fittings common to all pieces. 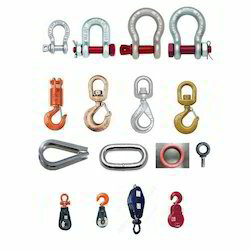 Hooks, master links and auxiliary links are manufactured from quenched and tempered steel alloy. It is available in a choice of two, three or four leg versions and is attached with a metal component for effective usage. 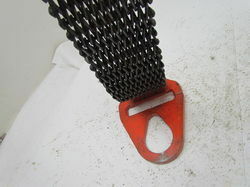 These slings are directly stitched directly to the metal components. These attachments provide for the efficient handling of loads with permanent lifting points. Endless type bridle slings allow for the rotation of the fittings resulting in an infinite number of attachment and load contact point. Do not place the load carrying splice in a connection point to the load or in the lifting mechanism. Even load weight distribution an all legs. The legs must be of the same length, if the load is to hang level. If the load is rigged and not all the legs are sharing the load, the assembly design factor is reduced. All bridle legs are used at the same horizontal angle. If the condition of the lift vary from those above, the work load limit must be re-calculated. WLL=1 X WLL of single leg made from similar slings. WLL=1.5 X WLL of a single leg from similar slings. We manufacture Bag Slings in any length as per customers requirement. 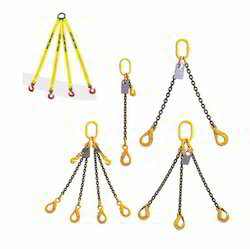 These are special type of slings used for lifting products requiring wider support / holding while lifting.These slings provide wide contact to surface area of the product for minimum slip age and even distribution of load on to sling while lifting. We manufacture a wide range of Automobile lashing systems for all cars, Trucks, Trailers, Earth Movers. 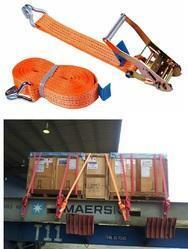 These lashing systems are mainly used for safe transit of these vehicles. We manufacture these lashing systems in accordance with EN 12195 standards. We offer high qulaity Plate & Beam lifting clamps. 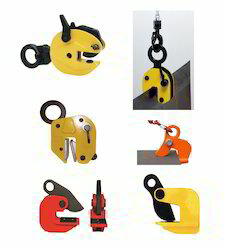 The vertical lifting clamps are suitable for lifting and vertical transfer of single steel plate and H Beam. It may be used single-handedly or pairs of clamp used together. It is fitted with a locking device for both open and closed positions which ensure complete safety. The Horizontal Clamps are used for lifting & horizontal transfer of single steel plate. One pair or two pairs of clamps should be used together. The Beam Clamps or Girder Clamps offers a quick solution when a load needs to be lifted from a stationary point. The screw mechanism allows for safe adjustability for a wide range of flange widths and beam sizes. Available in capacities from 1.0 to 16 tonnes. Offering Tirfor, Pulling & Lifting Machine, Wire Rope Winch. Stockiest of high quality imported Tirfor also called as pulling & lifting machine or wire rope winch. Tirfor® machines are portable manual hoists used with maxiflex wire rope. 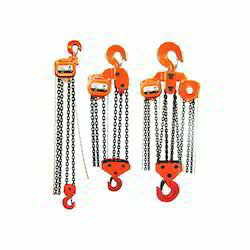 They can be used to lift, pull and position loads over great distances depending on the wire rope length. They are suitable for use in numerous configurations and are the ideal solution for use in professional applications; they are operated by a simple lever Option: the load capacity of the Tirfor® system can be increased by using sheave blocks. 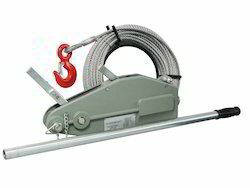 Portable hoist to lift and pull loads, for utilization in numerous configurations with long cable lengths. Wire Mesh Slings are specialized industrial lifting slings widely used in metal working applications and are heavy- duty rigging slings for positioning coiled strip for slitting and handling sheet steel, hot rolled flat bar stock and cold drawn flats. Other applications include the efficient handling of pre-stressed concrete, pre-fabricated wall panels and pre-cast hollow core concrete beams. Wire mesh slings are fabricated and repaired on a daily basis. 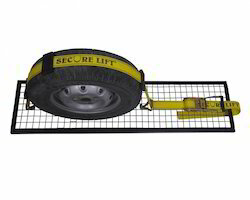 The Wire Mesh Lifting Sling welded edge construction will outlast and outperform brazed edges. The brazed edges are sure pretty, but are not as durable as the welded edge on every wire mesh lifting sling. Our Wire Mesh rigging slings are fabricated in a timely manner and you will receive the same service level that you have come to know and expect. The unique woven wire construction of Wire Mesh Slings consists of a series of smooth, spiral wires joined together across the sling body. This construction gives mesh slings flexibility, long life, wide bearing surface in a single plane for improved gripping, tighter choker hitches and improved load control. The improved handling characteristics have led to Wire mesh lifting slings to be referred to as gripper slings or metal mesh slings. The standard metal mesh material is high strength, Carbon Steel (10 gauge) or 4130 Heat Treated Alloy. Wire Mesh Slings can be used where loads are hot, abrasive or tend to damage synthetic slings. Uncoated, Wire Mesh Slings grip the load with little stretch and withstand temperatures to 550(F)/287(C). Available is widths from 2" to 20" and capacity from 1.6 to 22 Tons. Looking for Lifting Tackles ?